A wreck loaded in around it, trapping it and me inside. Please teleport it out. Now press Enter and use the command above in the little gray box that appears. I'm also stuck, but inside my prawn. I've tried everything and since I'm on Xbox one I have no access to console commands. Is there anyway I could get teleported out? I'm unable to load to a previous save because I'm stuck in the same spot. For consoles you will need to wait for them to put the console back in which they (for whatever reason) took out. They used to exist on Xbox but at 1.0 release for consoles they pulled it out, which IMHO was a bad move. They did say they're putting it back in but I don't know when that will be. I have the same problem, was in my moth and bam a wreckage structure spawned around me and now i can't escape. Need the console or be able to send the devs my save file so they can fix it. I have a similar problem with my Prawn stucked inside alien base wall and i am absolutely unable to get it out, i already tried all existing console commands like, biome XYZ, warp, warpforward, batch XYZ... every single one including kill and freecam tries but that Prawn never moved away from stucked position. I even can not exit the prawn, because some "spawn error" is written on the screen. I uploaded my savegame folder so anyone can look at it, but i cannot post links because i am here for a short time. I'm pretty sure the devs removed the terraformer as of lately. dig command simply do nothing, but item spawn commands and others (freecam) works normally. Best option is, devs will check the savegame and look at the catch. Sure, sure, you can use commands, but you'd be disabling achievements, don't you like them or are you fine with achieving something on your bucket list. Speaking of "bucket list", does anyone else not really get the picture there? I don't understand why they are using the word bucket. I like Ahcievments, but there is no another option, how can i delete this stupid bug? There is no another option, than some hack/crack/cheat... but problem is, even the console commnads does no work, that is the problem. The Mighty Console is useless.... how can this happen? Console is always supergod but not in this case. Same problem here, my Prawn is stuck underneath a piece of my base. I'm trapped in it, can't exit (SpawnNearby Failed). I also tried console commands but same as @puma365 said: none got me out. Including 'kill', which does kill me but i respawn in my Prawn. edit: also tried setting "exosuitPresent" in gameinfo.json to 'false', hoping that would make my prawnsuit disappear but nope; still trapped inside the damn thing. soooo... since none of the devs has responded to this issue since this thread started; i guess our saves are borked and we have no other option than to start over? Only option is Terraformer and get your achievements on a later playthrough. Or restart. I above screenshot you can see how my Prawn is stuck. I can rotate 360 deg and look up and down, but it won't move. 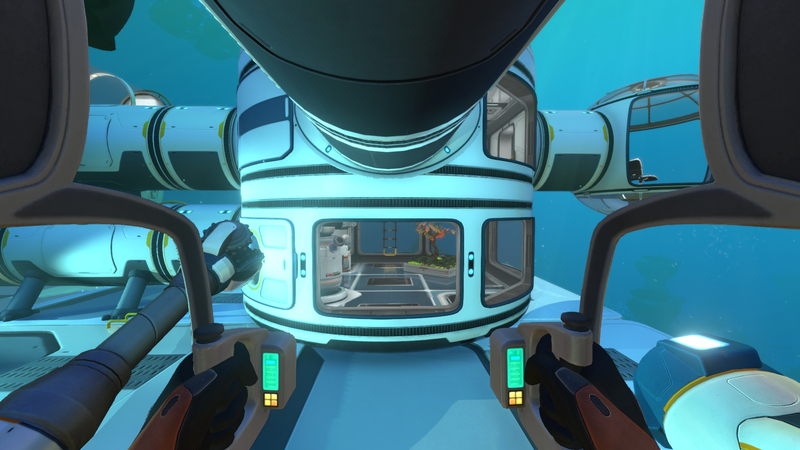 Since the hatch is on top and the top is covered by a tubular compartment, there is no way to exit the Prawn. Weird thing is i already passed under this compartiment multiple times in multiple playthroughs without getting stuck. All of a sudden wham. Can't move. So restarting is the only option. No biggie for me, already 20hrs in this save but i'm having fun doing it all over again. However, this is a silly bug that should be addressed. Yep, tried all of the warp commands and none work. The screen flashes briefly but that's it. When i try 'goto aurora' there is a message on screen that says 'Jumping to position (1157.0, 3.5, 113.0)' but in reality i don't move. And yes, with 'kill' I die and respawn back in the Prawn suit. Nah, i'm good. Already started a new game. Maybe somebody else who's stuck wants to try that. Or maybe one day the devs pick this up and fix it.